The present invention relates to dispersions or slurries of particulate solids in water; in particular to dispersions of mineral solids which normally tend to aggregate, settle or phase out, and to a method of inhibiting those phenomena in slurries containing such mineral particles so as to improve the viscosity of such slurries making them more workable. The present invention is suitable to produce slurries of various particulate solids, for example calcium carbonate for the paper industry and clays for use in the ceramic industry, but in fact the invention may be used for producing a workable aqueous dispersion or slurry of any solid particles in high concentration. Previous attempts at producing such aqueous dispersions are described in, for example, EP-B-0129329. This document discloses pigment slurries containing water soluble polymers of molecular weight from 1,500 to 6,000 formed from one or more ethylenically unsaturated monomers and containing acid groups selected from carboxyl and sulphonic groups. The present invention shows enhanced performance over this prior art. US-A-4,868,228 discloses grinding agents in aqueous suspensions of mineral materials, and, in particular, the use of such grinding agents to produce low viscosity aqueous suspensions of mineral solids. The grinding agents are described to be acrylic acid polymers and/or copolymers that are completely neutralised by at least one neutralising agent having a monovalent function and at least one neutralising agent having a polyvalent function. 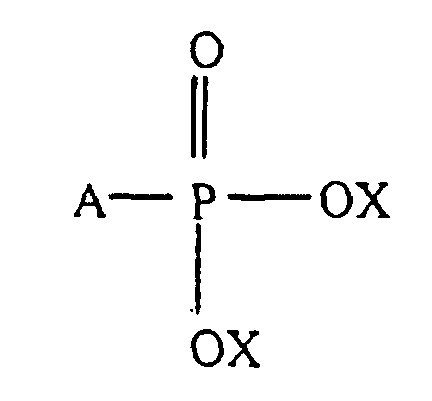 EP-A2-0705892 teaches dispersions or slurries of solid particles in water which also comprise a phosphonocarboxylic acid or a water soluble salt thereof of the following formula, as a dispersing: H[CHRCHR]n · PO3M2/v wherein at least one R group in each unit is a COOM1/v group and the other R group is hydrogen or a COOM1/v hydroxyl, phosphono, sulphono, sulphato, C1-7 alkyl group or a carboxylate, phosphono, sulphono, sulphato and/or hydroxy substituted C1-7 alkyl or C1-7 alkenyl group, and each M is a cation such that the phosphonated carboxylate is water soluble and n (the number of monomer units in polymerised form in the polymer chain) is from 1 to 6 and preferably less that 5, for example 1 to 3. The solid particles dispersed in this prior art preferably have a particle size of less than 1mm, for example less than 0.5mm, preferably 0.5 to 100 µm especially 1 to 50 µm. The present invention seeks to provide improved dispersions or slurries of solid particles in water. It is well known, for example see WO-A-92/00347, that it is especially difficult to achieve stable dispersions of fine materials; thus, it is of particular interest to produce stable dispersions of fine solid particles, such as those which have a significant proportion with a particle size of less than 2 µm. hydroxypropyl acrylate, propyl methacrylate, 2-acrylamido-2-propane sulphonic acid, sodium styrene sulphonate, sodium allylsulphonate, vinyl sulphonic acid, and salts thereof; acrylamide, methacrylamide, tert-butylacrylamide, (meth)acrylonitrile, styrene, vinyl acetate allyloxy-2-hydroxypropyl sulphonate and dialkylacrylamide; and further wherein A contains at least 10 monomers in polymerised form. The number of monomers in polymerised form can be from 10 to more than 100, but preferably it is from 15 to 85 and most preferably from 25 to 60. The dispersing agents may have a weight average molecular weight of from 1000 to 10,000, and dispersing agents having a weight average molecular weight of from 2000 to 6000 are especially preferred. Although stable dispersions with a low viscosity can be obtained with dispersing agents of a higher molecular weight, there is an increased tendency for gel formation with polymers of molecular weight above 6000 which may be disadvantageous in some applications. The invention is particularly suited to forming dispersions of very fine particles, for example, those in which 70% or more of the particles are below 2µm, and preferably those in which 70% or more are below 1 µm. The invention works particularly well with dispersions of fine particles in which 95% or more of the particles are below 1 µm. 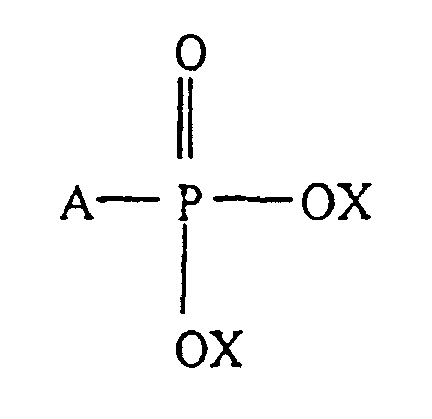 The water soluble dispersing agent is preferably a phosphono terminated homo- or co- polymer of acrylic acid. 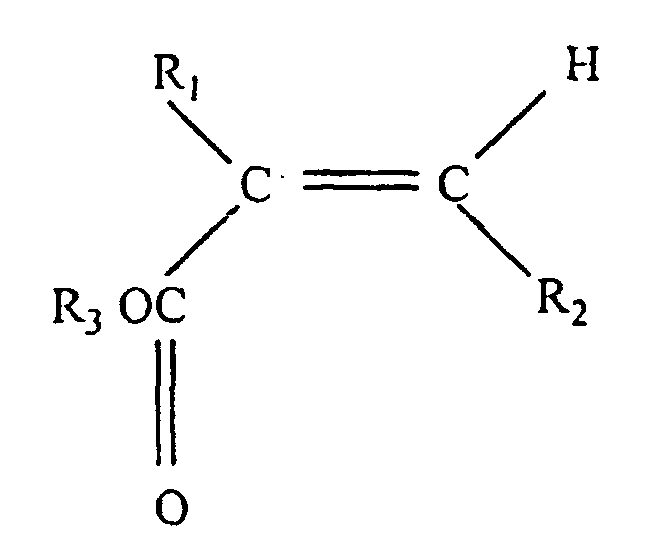 The other monomer if the dispersing agent is a copolymer may be maleic acid or maleic anhydride, methacrylic acid, sulfonic unsaturated monomers or any unsaturated polymerisable monomers having a COOH group. Such polymers may be made, for example, according to US 4,046,707, US 5,376,731, US 5,077,361 and US 5,294,686. The dispersed or suspended solid may be any particulate solid which is sufficiently chemically inert to be dispersed or suspended in an aqueous medium. The particles are preferably inorganic, and substantially insoluble in water. Examples include calcium carbonate, clays, kaolin, talc and metallic oxides. The liquid medium may be water, or a water-containing solution. This medium may also contain alcohols, glycols, surfactants or wetting agents. The composition of the present invention provides at least two important advantages, namely, a reduction in viscosity of the dispersion and a reduction in the tendency of the dispersion to form a gel particularly in fine particle dispersions. In addition, these benefits are obtained for systems in which the percentage by weight of the solid particles in the dispersion is high, for example greater than 60% and preferably greater than 75%. hydroxypropyl acrylate, propyl methacrylate, 2-acrylamido-2-propane sulphonic acid, sodium styrene sulphonate, sodium allylsulphonate, vinyl sulphonic acid, and salts thereof; acrylamide, methacrylamide, tert-butylacrylamide, (meth)acrylonitrile, styrene, vinyl acetate, allyloxy-2-hydroxypropyl sulphonate and dialkylacrylamide; and further wherein A contains at least 10 monomers in polymerised form. 3) grind calcium carbonate to the desired particle size and mix with water and a dispersing agent to form a slurry. General Method (A) to Prepare Dispersions of Either Coarse Or Finely Precipitated Calcium Carbonate and Measurement Of Viscosity Thereof. a) An aqueous solution is formed by dissolving a dispersing agent in water in a beaker. c) Agitation is maintained for about 10 minutes after the addition of the mineral solid. d) Finally, viscosity is measured immediately, and then after 1 hour, 24 hours and 48 hours using conventional viscosimeters, such as Bookfield, Ford cup etc. General Method (B) to Prepare Dispersions of Ground Natural Calcium Carbonate and Measurement Of Viscosity Thereof. a) Water, dispersing agent and natural calcium which is to be ground are introduced in a vessel containing the grinding agent (balls). b) The solution is then shaken or agitated until the desired particle size is obtained. c) The viscosity of the solution is then measured immediately and then after 1 hour, 24 hours and 48 hours. Viscosity may be measured using conventional viscosimeters, such as Bookfield, Ford cup etc. DISPEX N40, DISPEX DP 6 and DISPEX 2695 are commercial dispersing agents available from Allied Colloids Limited. DISPEX is a trade mark owned by Allied Colloids Limited. Dispersing agents 1, 10 and 11 were prepared using a method well known to those skilled in the art using isopropyl alcohol (IPA) as the chain transfer agent. Dispersing agents 2, 6, and 9 were prepared using sodium hypophosphite (NaHP) as the chain transfer agent. Dispersing agents 7, and 8 were prepared using sodium metabisulphite (SMBS) and dispersing agents A-I are phosphonate containing polymers of the present invention and were all prepared using phosphorous acid (H3PO3)as the chain transfer agent. Aqueous dispersions of precipitated calcium carbonate with particle size 70%<2 microns were prepared using General Method (A) described above. The Viscosity and gel tendency results are given in Table 2 below. The above results demonstrate that the dispersing agents used in the present invention, i.e. C, D and G, provide dispersions with significantly lower viscosity than dispersing agents 1 and 2. 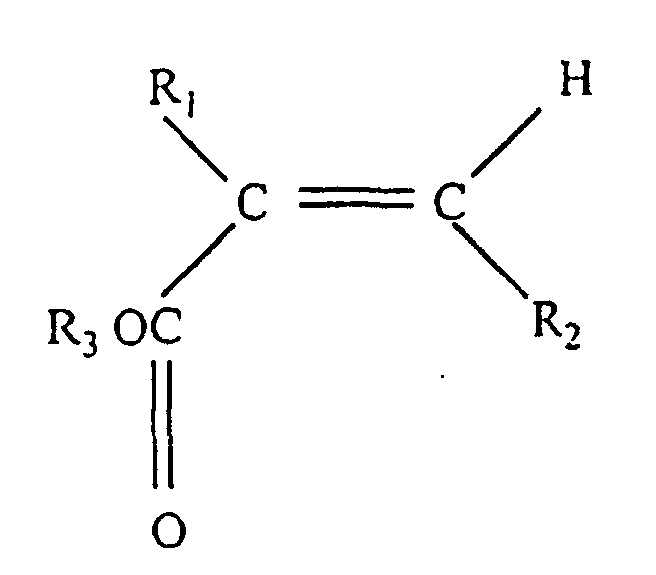 Also, with dispersing agents C and D, in particular, the gel tendency is much lower than that obtained for similar dispersions using non-phosphonate containing polymers as the dispersing agent. Aqueous dispersions of ground natural calcium carbonate with particle size 79-83%<1 micron were prepared using General Method (B) described above. The Viscosity and gel tendency results are given in Table 3 below. As the above results show, dispersing agent A which contains phosphonate groups and is according to the present invention, provides favourable viscosity and gel tendency as compared to the comparative dispersing agents 3, 4, 5 and 6. Aqueous dispersions of precipitated calcium carbonate with particle size 95%<1 micron were prepared using General Method (A) described above. The Viscosity and gel tendency results are given in Table 4 below. From the results in Table 4, it is to be noted that phosphonopolycarboxylic acids provide a significant improvement in the viscosity and gel tendency of dispersed of calcium carbonate with 95% of the particles being less than 1 micron in size. 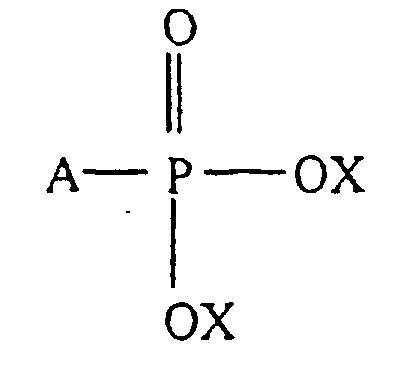 Example 4: - Comparison of the Viscosity of Dispersing Agent C Against the Viscosity of Dispersing Agent 12 (the preferred phosphonated oligonmaleate of EP-A-705892 which was prepared according to Example 1 of EP-A-0569731). 75% Aqueous dispersions of precipitated calcium carbonate with particle size 90%<1 micron were prepared using General Method (A) described above. 0.8% dispersing agents were used. The viscosity was measured using a Brookfield viscosimeter RV model (spindle 4) at 10, 20, 50 and 100rpm. The results are given in Table 5 below. 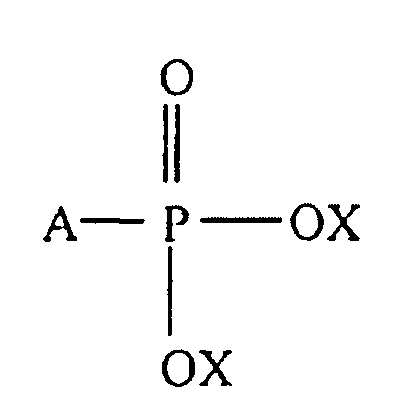 Example 5:- Comparison of the % Torque of Dispersing Agent C Against the % Torque of Dispersing Agent 12 (the preferred phosphonated oligonmaleate of EP-A-705892 which was prepared according to Example 1 of EP-A-0569731). 75% Aqueous dispersions of precipitated calcium carbonate with particle size 90%<1 micron were prepared using General Method (A) described above. 0.8% dispersing polymers were used. This time the % Torque was measured at time = zero, and after 1, 2 and 7 days using a Brookfield viscosimeter RV III model and a helipath spindle (1rpm/25s - spindle C). The results are given in Table 6 below. Torque is related to the gelation behaviour of calcium carbonate slurries. A Comparison of the Gel Tendency Results Obtained For Dispersing Agent C Compared Against Dispersing Agent 12. As the results in Tables 5 and 6 above demonstrate, the phosphonated dispersing agents of the present invention provide significantly improved performance over the dispersing agents of prior art document EP-A-0705892, providing stable dispersions with a lower viscosity, even after standing for several days. Dispersion according to Claim 1 comprising at least 60% by weight of the dispersion of the particulate solid. Dispersion according to Claim 1 wherein the weight average molecular weight of the dispersing agent is from 1000 to 10,000. Dispersion according to Claim 1 wherein the weight average molecular weight of the dispersing agent is from 2000 to 6000. Dispersion according to Claim 1 wherein 70% or more of the particulate solid has a particle size of less than 2µm. 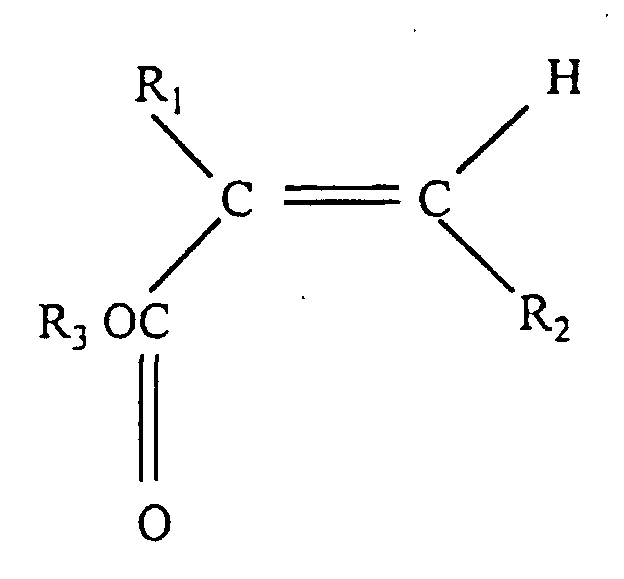 Dispersion according to Claim 1 wherein the dispersing agent is selected from the group consisting of a phosphonate terminated homopolymer of acrylic acid with a weight average molecular weight of from 2000 to 5800 and a phosphonate terminated copolymer of acrylic acid and maleic anhydride with a weight average molecular weight of 2000 to 5800. Dispersion according to Claim 1 wherein the particulate solid is selected from the group consisting of one or more of calcium carbonate, kaolin clay, talc and metallic oxides. 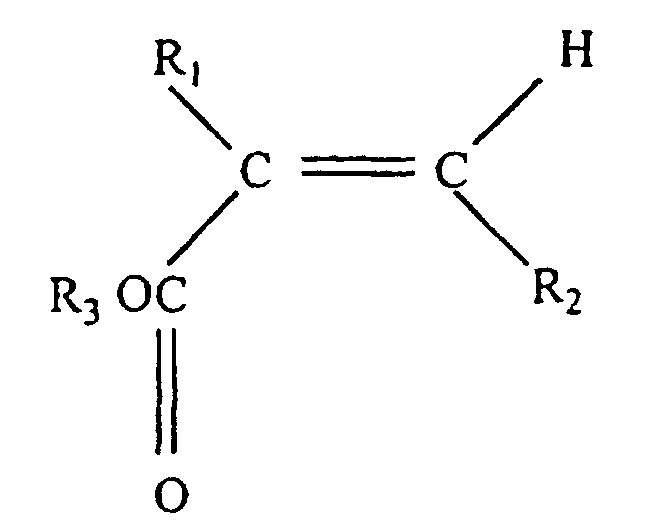 and further wherein A contains at least 10 monomers in polymerised form. Method according to Claim 8 wherein the dispersion comprises at least 60% by weight of the particulate solid. FR2981939B1 (en) 2011-10-26 2015-02-20 Coatex Sas Process for the manufacture of aqueous suspensions of talc is from an acrylic polymer a surface-active function grafted obtained suspensions and their uses. MX2018009535A (en) 2016-02-04 2018-09-06 Basf Se Method for producing acrylic acid polymers. ES2126610T3 (en) 1992-04-16 1999-04-01 Albright & Wilson Uk Ltd Agent for water treatment. ES2256321T3 (en) 2006-07-16 Process for the production of polymer dispersions in water water.